This book shows how to predict eclipses, solve Kepler's Equation, solve spherical triangles, predict planetary positions etc. Since the publication of the book “Vedic Mathematics” by Sri Bharati Krsna Tirthaji in 1960 many new applications of the Vedic system have been found. Vedic Mathematics contains many examples of striking methods of calculation and there is a remarkable coherence to the system which makes it very attractive. Also the Vedic system itself suggests a kind of approach that involves going directly to the answer. Vedic mathematics is based on sixteen Sutras and some sub-Sutras which provide links through mathematics: the word ‘Sutra’ means ‘thread’. These Sutras are given in word form, for example Vertically and Crosswise and By Addition and By Subtraction, and where they arise in this text they are indicated by italics. The Sutras, and sub-Sutras, can all be related to natural mental functions. A full list of the Sutras and sub-Sutras will be found on Page 138. Having had a keen interest in Astronomy for many years I had the opportunity, when studying for a degree in this subject, to look into Astronomical Applications of Vedic Mathematics for a final year project (in 1981). The result was what is now the contents of Chapters 2 and 3 of this book. The left to right method of calculation, which has so many useful applications (see “Vertically and Crosswise”, Reference 3), was initially developed by the author in order to solve Kepler’s Equation. Being encouraged to publish this work and take it further by studying for a higher degree, more such applications were found. The methods given in this book are not intended to be a complete or thorough treatment of the topics they deal with. All of the ideas can probably be developed further or applied in other areas, and all can doubtless be improved upon. The mathematician will also observe a certain lack of rigor as an attempt has been made to make the material intelligible to as wide a readership as possible. To this end a Glossary and an Index have been added. 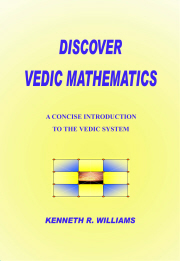 An attempt has also been made to make the book as self-contained as possible so that the first chapter introduces some of the Vedic methods of calculation which are used in the book and the fourth chapter introduces the arithmetic for Pythagorean triples which is used in the subsequent chapters. In this self-contained book a few applications are given including Prediction of Eclipses, the digit by digit solution of Kepler’s Equation, the Prediction of Planetary Positions and the Solution of Spherical Triangles. Normally the solution to such problems would not be attempted without the aid of a mechanical calculating device. But the ultra-efficient methods of Vedic Mathematics lead to easy and fast solutions without the need for such aids.